A checklist for protecting against electronic eavesdropping and general information theft. Off-site meeting security against electronic eavesdropping and general information theft can be challenging for organizations. Any location you do not control is a prime target for infiltration, bugging and theft of confidential paperwork. 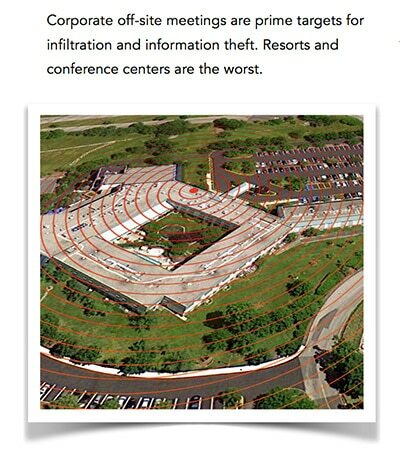 Resorts and conference centers are the most difficult places to secure. This compelling video (2 min.) shows one espionage tactic in action. It is not at all unusual to catch the competition (and unidentified others) hanging around, eavesdropping, crashing meetings and banquets, picking up unsecured papers and engaging meeting participants – just one indiscretion can blackmail a loyal employee into becoming a million dollar problem. Following a few simple rules, however, can dramatically reduce your off-site meeting information security vulnerabilities. Many of the following recommendations may be applied to your on-site Board meetings and conferences, as well. Have questions? Need advice? Visit our Contact page. We are here for you. Let us know where to send your free Off-Site Meeting Security PDF download. We won’t call you unless asked, or share your information. Promise.